The World's Best Porkchop - JP loves LIFE! I know this isn’t necessarily what everyone would feel is “blog-worthy” but it most definitely is. 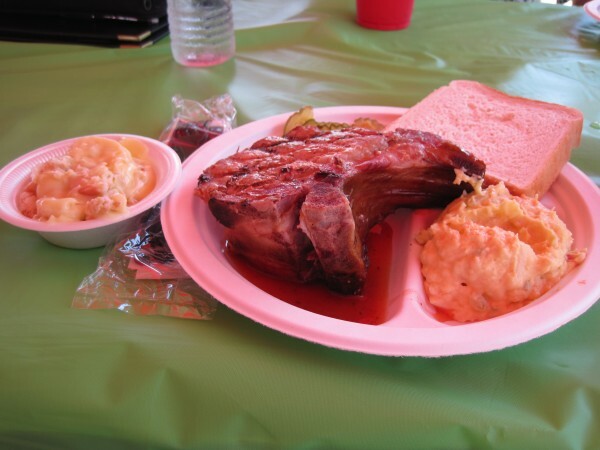 I have become enamored with the smoked pork chops some field days serve in Texas. They are incredible – inches thick and moist…. Yum! And yes, the chops are so good, the I look forward to it for weeks in advance of the actual trip! 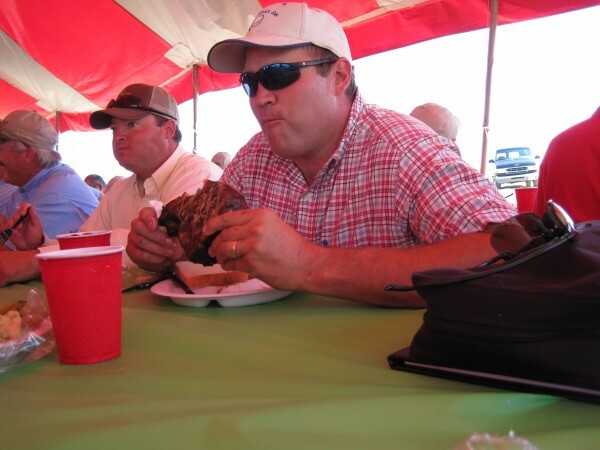 Here are some photos I thought some of my food and agriculture readers may like to see… You may want to star planning a trip to Lubbock next September to get one for yourself! Jeana (aka the porkchop lady) makes them available for all sorts of catering though so maybe we could get some before then! Thanks to the hog farmers like Chris Chinn, Mark McHargue, Heather & Marc Hill and Mike VerSteeg for doing such a great job raising such awesome food for the rest of us! If you ever find yourself here in Iowa, go into a Fareway grocery store and in the meat department ask the butcher for some “Iowa Chops”. Same thing. I am always responsible for brining them on our camping trips to Wisconsin and Minnesota for our out of state friends, and yes, we eat them with our hands right out of the grill baskets. 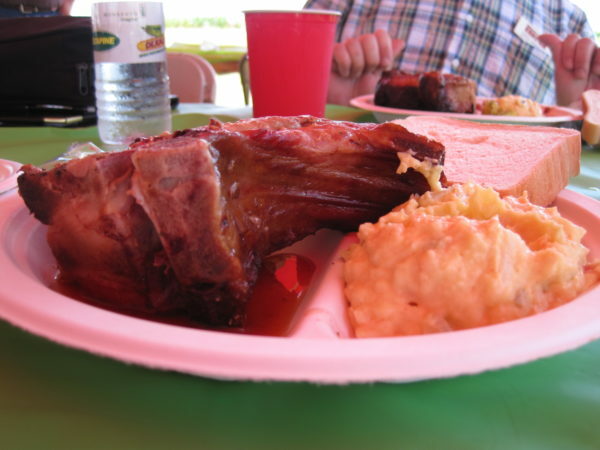 Um, Jus sayin…..We are known for our pork chop cook outs around here. Biggest and best fund raiser by far…. and we rock pork chops. I am a beef producer so for me to brag up the pork chop… know it’s good 🙂 A dry rub that butterfly chops marinade in over night. (sometimes bone in chops). I’m not involved as much as I use to be but Pork Chops it’s what we sold at games, jamboree’s, picnic’s our Schools, our fire departments and area’s #1 fundraiser. My BFF Jill C. and 2 of my other buddies still go around locally and semi-locally for Macoupin Co. Pork Producers and sell the amazing chops. I buy the spice mix in a 25 lb bag and give as Christmas gifts in pretty jar’s. It seems to be pretty regional and can’t just buy it anywhere. Janice-I was reading your article on the picker and and round bales. Scrolled down and seen the pork chop section. Really appreciate it!! and all yaws business!!! Have mercy! I have no idea how you found my blog Jeana but I’m so glad you took a minute to say hello. Janice, from the pictures they look like a pretty good meal! When in St. Louis, take a trip to G & W Bavarian Sausage Co (http://www.gwsausage.com/). They have smoked pork chops (Kessler) they sell which are quite tasty. You can get them cut as thick or thin as you desire. Cheers! Thanks! I live in St. Louis now so I should check that out!